The wheels on the Mutiny kept turning. 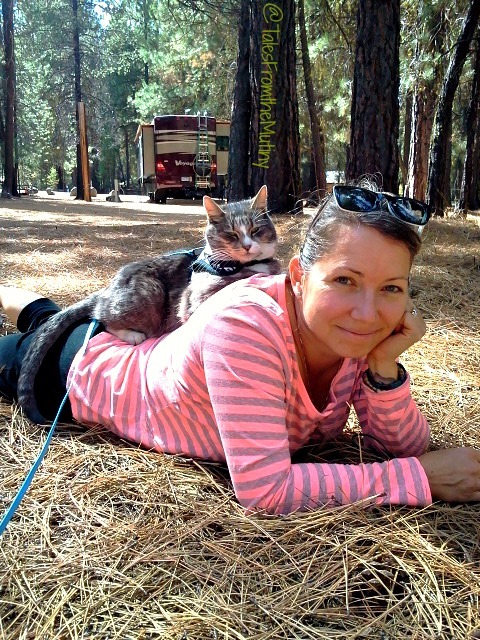 I (Lynn) had to be in Grass Valley, California on October 10th for a 30 day immersion for Yoga Teacher Training. The course was paid for and pretty much all of our travels the past 4 months revolved around getting me there on time. With just a few more weeks to go before I’d be living at an ashram, disconnected (for the most part) from the rest of the world, we wanted to take advantage of new places and get a chance to hike part of the Pacific Crest Trail in two different states (a dream come true even though I’d love to hike the entire trail). 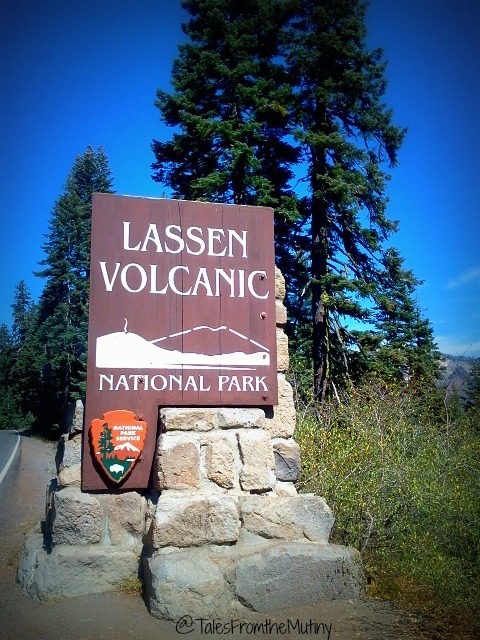 Having lived in Northern California for 20+ years it may come as a surprise that I hadn’t been to Lassen Volcanic National Park, until now. California is home to so many wonderful State and National Parks, and the state is pretty big, that it’s easy to put off seeing everything. And truthfully, my 60+ hour work week left me pretty exhausted. Vacation time was earned but rarely taken…if you know what I mean. 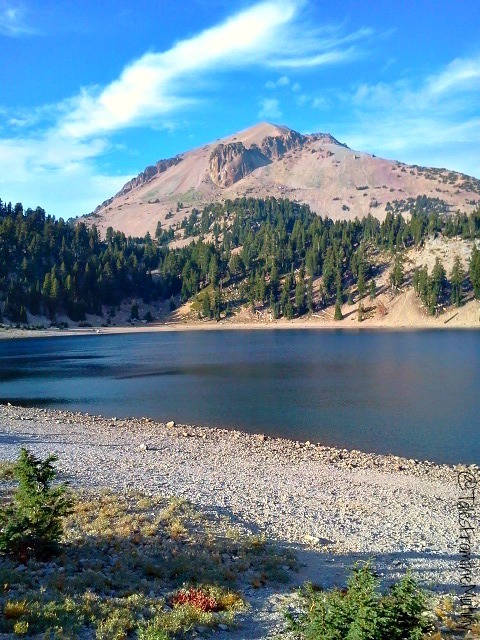 So, as we headed south from Bend we decided Lassen would be a great place to get back to nature after all the socializing and drinking during the Sister’s Folk Festival. To break up the drive south we stayed a few days at Collier Memorial State Park in Oregon. This is a really great park that offers full hookups ($26 per night) but with a remote feel. Trails originate right inside the camping loop and take you along a river, through an aspen grove and even to an old logging museum. 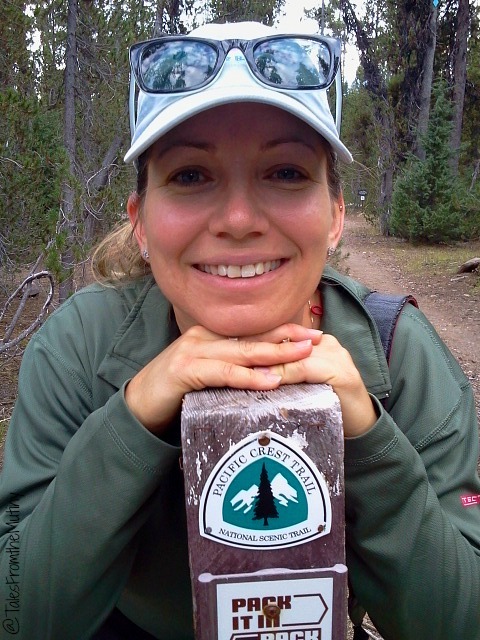 There’s no town nearby so it’s truly a place to unplug, hike, fish and relax. 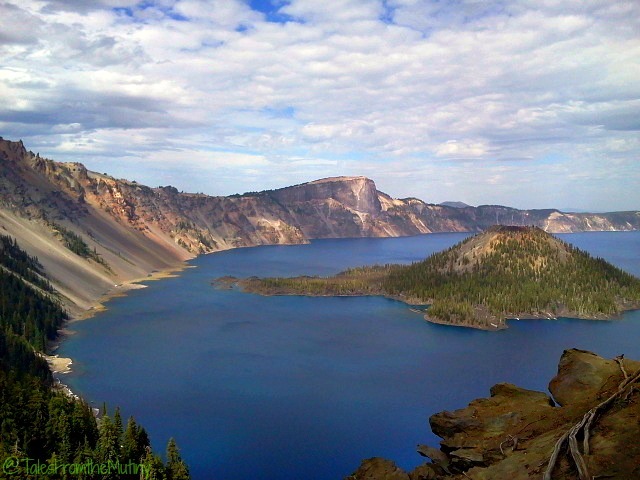 It is somewhat close to Crater Lake National Park though. At least close enough that we made a day trip out it (we’d been to Crater before so a day trip was suitable for us). 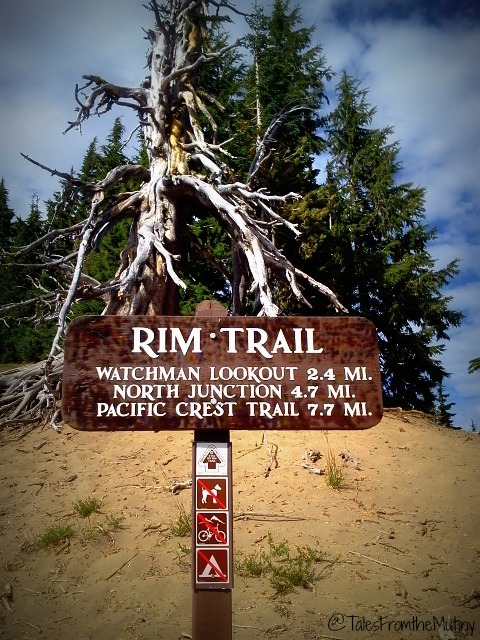 Hiking part of the PCT in Oregon. 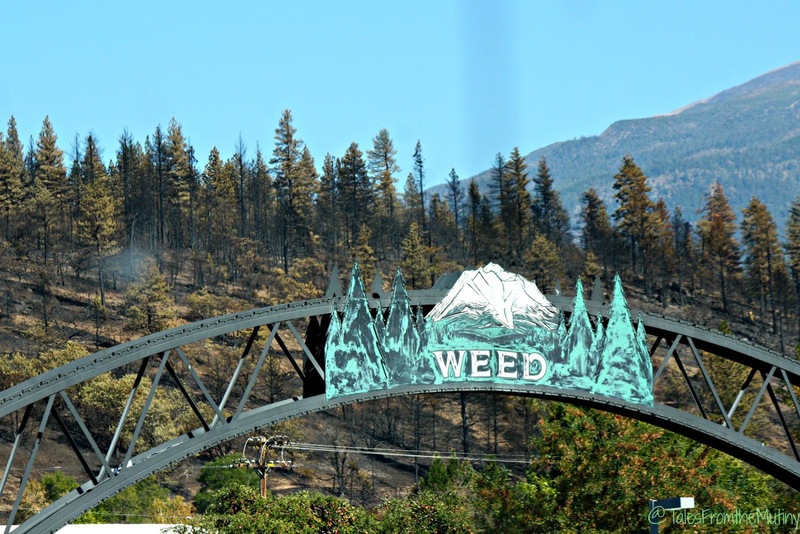 After a few days we headed into California passing through the town of Weed just days after the big fire ravaged the town. Our friends and fellow nomads, Mary and Forrest Clark, had just been volunteering in the area through the Red Cross DOVEs program (disaster operations volunteer escapees). You can read a bit about their story here and find information on the DOVES program here. Passing through Weed, CA where the hills were still smoking from the Boles wildfire that devastated the area. 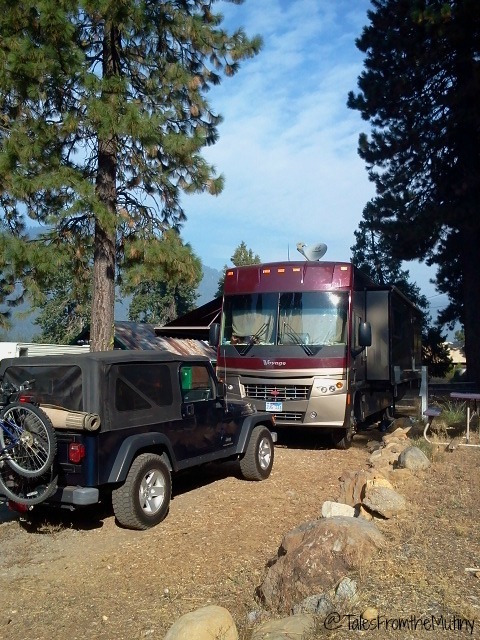 We camped outside of Lassen at Child’s Meadow Resort. While calling it a resort is a stretch we enjoyed our week stay. It’s a very rustic campground. No frills at all. But the views are grand. Although it’s located right on Highway 36 it’s quiet and the people who run the campground are very nice. Just don’t expect it to be anything like a resort. One morning we awoke to a dusting of snow on the mountains. Lassen Volcanic National Park encompasses just over 100,000 acres and is home to Lassen Peak, the world’s largest plug dome volcano. Established on August 9, 2016 this year marks it’s 100th birthday (so it’s a really good year to visit). Located at the intersection of the Cascade Range, the Sierra Nevadas and the Great Basin desert there’s are diverse habitats to explore. The park is also on the less crowded list with about 350,000 visitors annually. Our campsite at Child’s Meadow. Cold, foggy morning at the RV park. 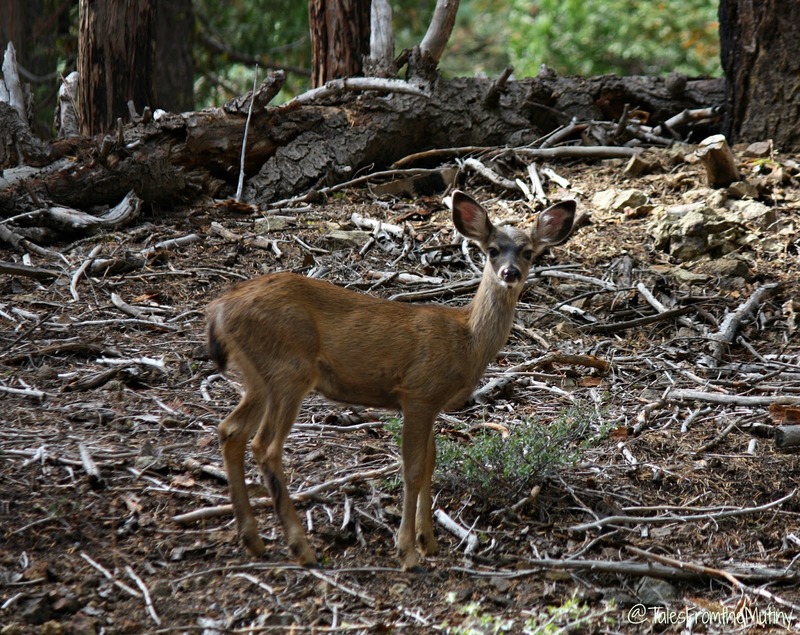 Our campground was situated closer to the Kohm Yah-mah-nee Visitors Center at the south western part of the park. 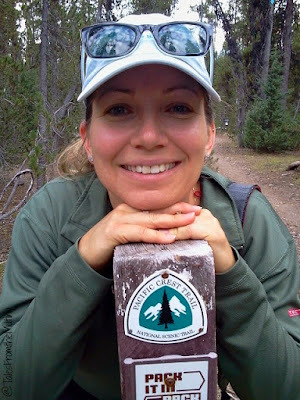 This gave us perfect access to some great hikes including Bumpass Hell, Terrace, Shadow and Cliff Lakes, Cold Boiling Lake and Mill Creek Falls. It was also the perfect place to summit Mt. Lassen but during our visit the trail was closed for renovations. 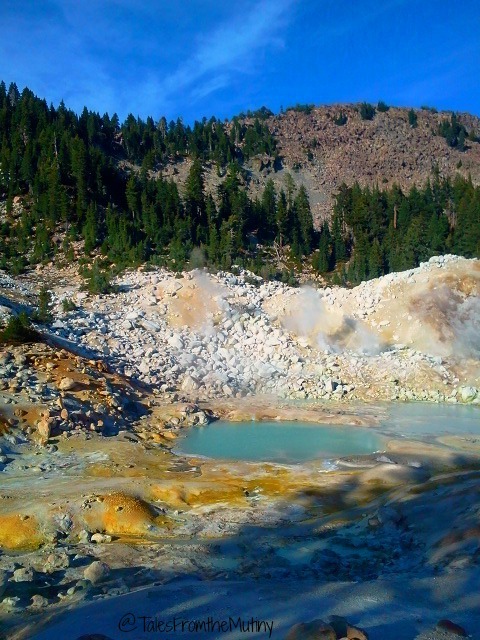 Bumpass Hell – (RT 3.0 miles out and back – Easy – 300 foot elevation change) It’s like a small version of Yellowstone with boiling turquoise colored pools and brightly yellow sulfur deposits. Highly recommended due to volcanic features (we came to a volcanic park after all). 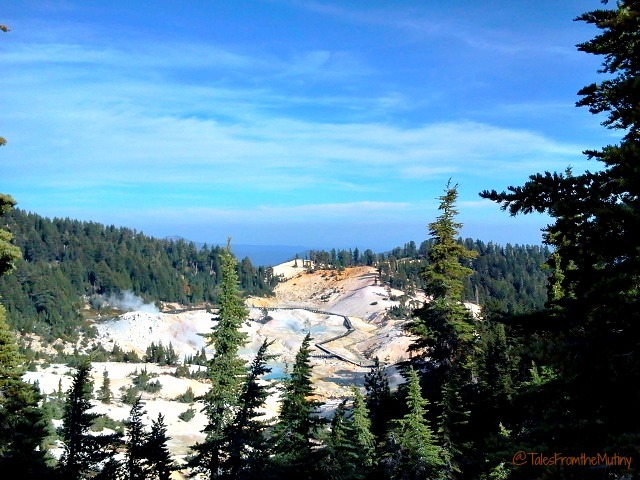 Bumpass Hell. You can make out the boardwalk over the thin crust of earth. The smell and heat radiating from the ground are clues that you’re close. Terrace, Shadow and Cliff Lakes (RT 4.0 miles- out and back – downhill all the way to Cliff Lake and uphill on return). Beautiful hike through the a lightly wooded area. The colors at the lakes are worthy of photos and Terrace Lake in particular is a nice spot for a picnic lunch. 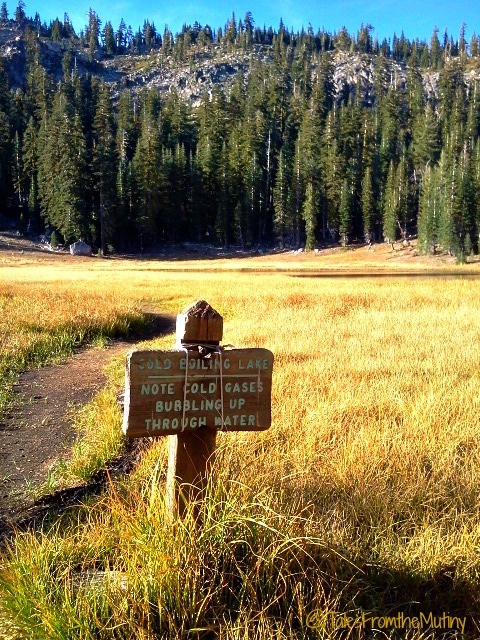 Cold Boiling Lake – (RT 1.6 miles out and back- easy, can continue on to Crumbaugh Lake and beyond) This was a quick side hike I did while Clark napped in the car after our lakes hike (see above). The hike takes you to a beautiful meadow full of birds (and I’m sure wildflowers in the spring). I was able to locate a small puddle near the lake that really displayed the bubbling of the water. The bubbling is due to gas, not heat, so the water is cold to the touch. Mill Creek Falls– (RT 3.8 miles, fairly easy) This is a pretty hike to a large water fall that apparently doesn’t like to be photographed. It seems that there just isn’t a really good spot in which to capture the thing on film. We brought a lunch and had a great break once we arrived but I have to admit I was a little sad that we weren’t able to photograph it. Pretty much the only photo I have of the waterfall…and it doesn’t even look like a waterfall. 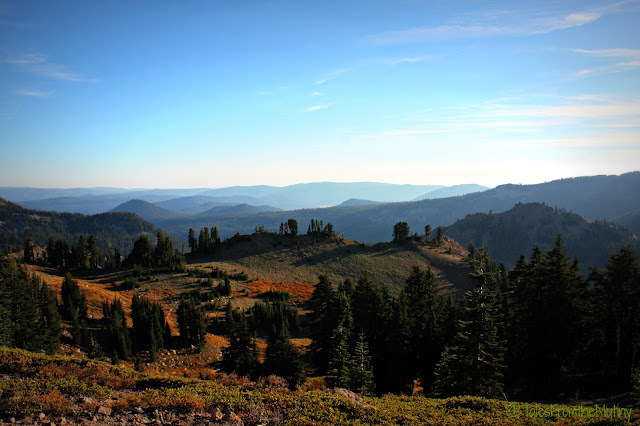 While hiking is always a big draw for us we were especially excited to learn that our visit to Lassen coincided with the annual Art and Wine of Lassen Festival. 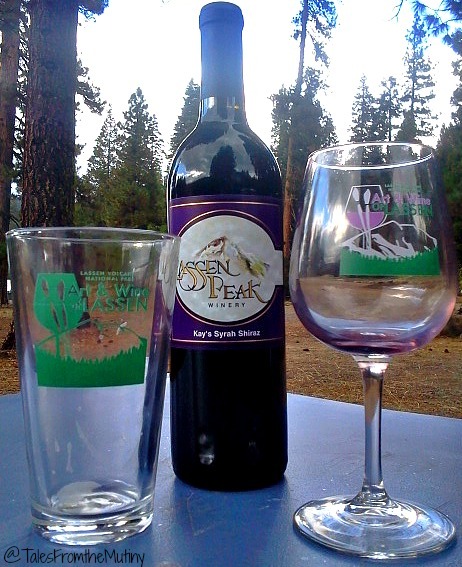 And who can pass up a wine tasting even in a National Park? Held at Kohm Yah-mah-nee Visitor Center the event is free to attend (and has live music) but the tasting is $7 (with a commemorative glass). Not a wine drinker? Well, for the same price you can get a pint glass and sample some of the local beers. Click here for all special events in the park. 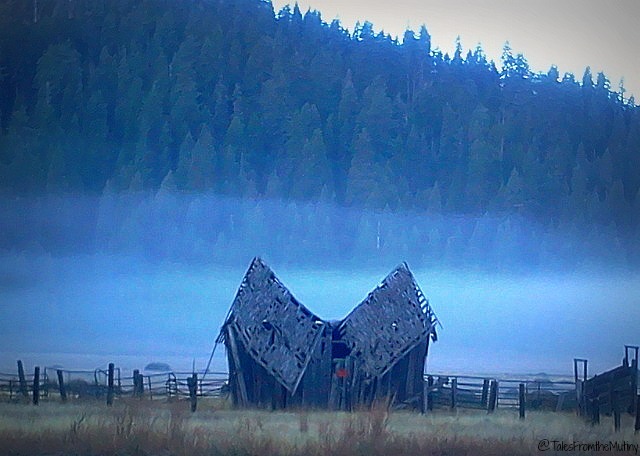 Drakesbad Guest Ranch is another section of Lassen that’s worth at least a day trip. 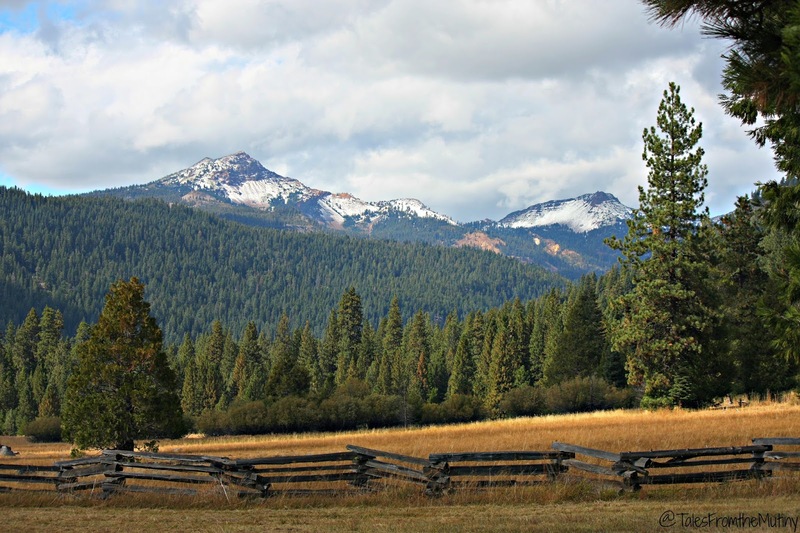 This historical site offers cabin rentals, horseback riding, hot springs fed pool, a small restaurant (reservations required even though it’s more of a buffet type setting) and loads of hiking trails. 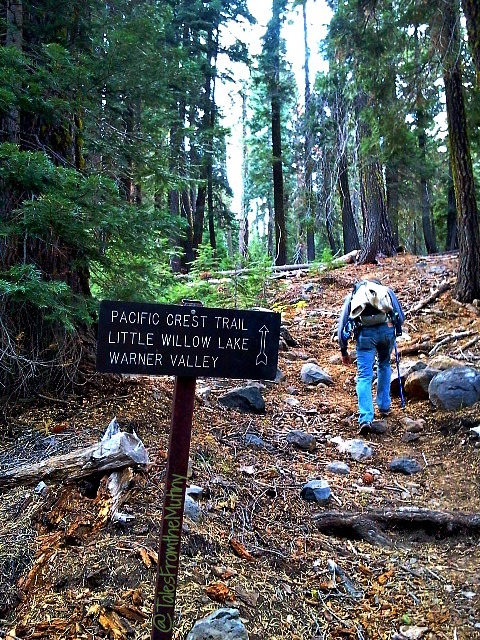 It’s also considered the halfway point of the Pacific Crest Trail. 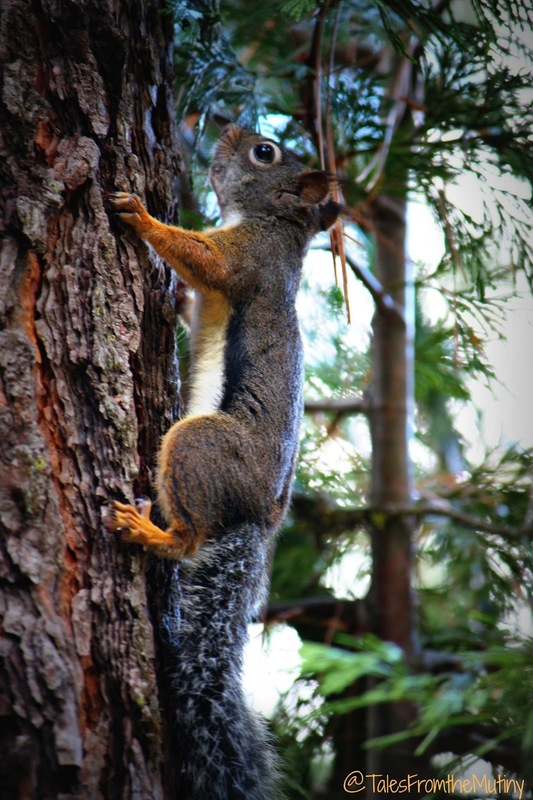 They host through hikers so, if you’re lucky, you might get to share a meal with some of them. 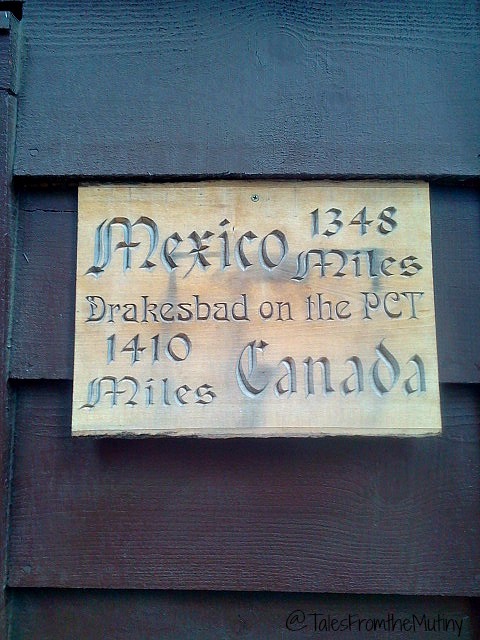 The sign at the ranch. 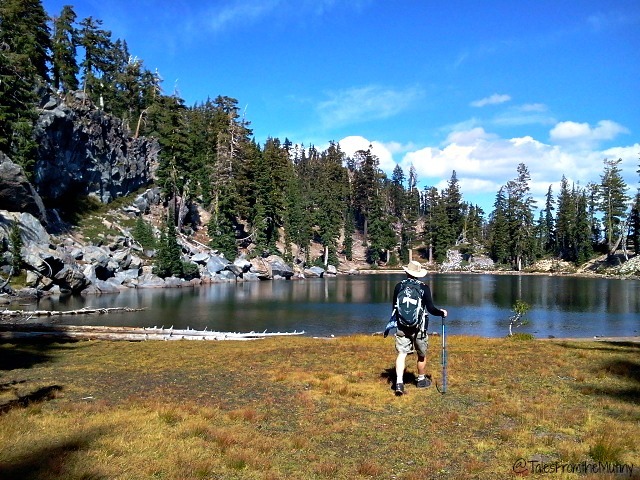 Boiling Springs Lake Trail– (RT 3.0 – fairly easy) – This hike takes you through the woods and to a 125 degree lake. 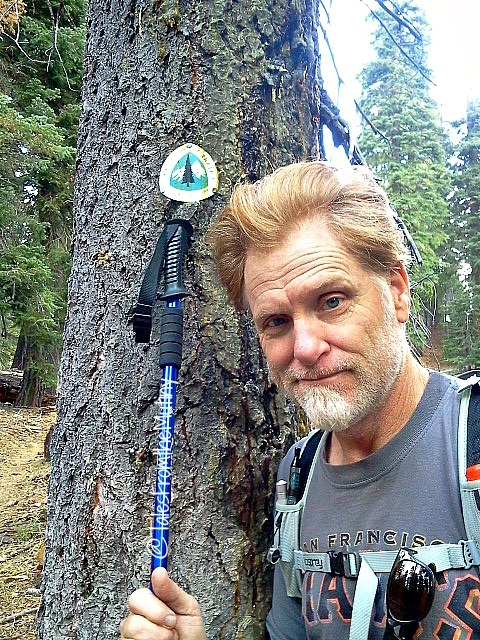 Can you tell how thrilled Clark was to extend our hiking day just so I could say I hiked part of the PCT in California? 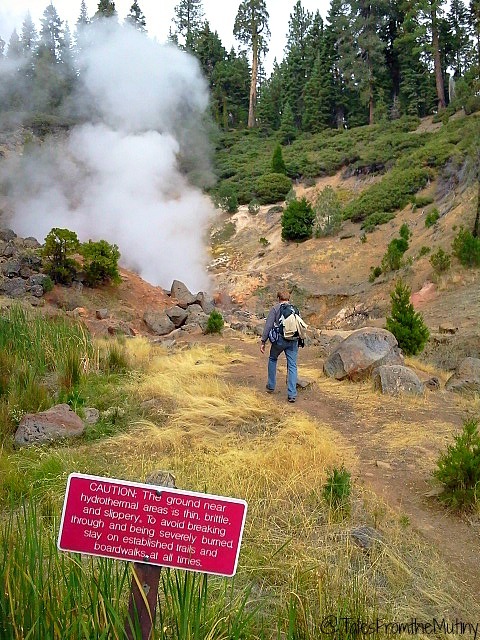 Terminal Geyser– (RT 6.3 miles give or take, or 1.6 miles past Boiling Spring Lake, moderate with a 1050′ elevation change) – Of course we continued on to Terminal Geyser since it meant we also got to hike a section of the PCT! 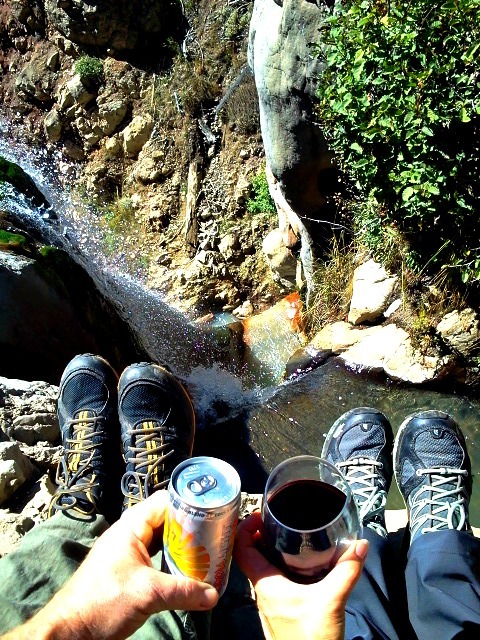 And we’re glad we did since it was a pretty awesome spot to rest before the hike back. 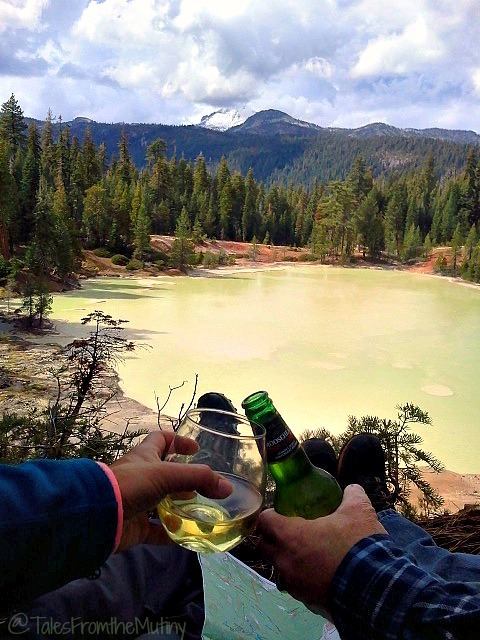 So I'm embarrassed to admit that I've been to Lassen a dozen times and still haven't been to Bumpass Hell…. next time! I agree, it's amazing and way less crowded (in our experience) than many other "big name" parks! Well, I guess you have a reason to go again! Haha, it's pretty neat (and a little smelly). Hopefully you'll get to see it soon.